I was reading an old issue of the Oxford American yesterday afternoon: the 2005 summer Southern Food edition. Scott had for some reason taken it from the magazine rack for a read and left it on the coffee table; I picked it up and enjoyed rereading it. There's something so comforting about reading a literary magazine, published in Arkansas, all about Southern food. 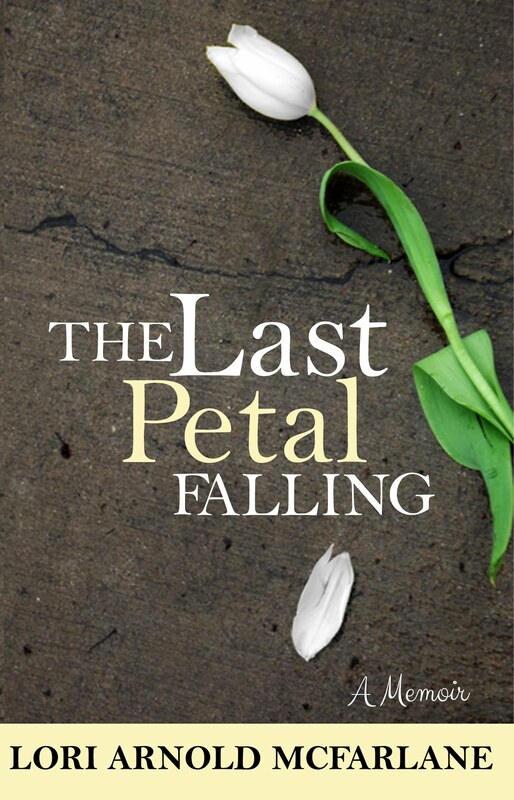 It makes me feel like I'm at home again, reading about fried frog legs, cornbread and okra. Even though our family didn't eat a lot of the typical Southern food, we still enjoyed a strong Southern influence in our meals. And of course we had grandparents who did prepare proper Southern food, for which I am now thankful for the happy memories. One thing I read in one of the articles really hit home for me - in the South, if it ain't about religion, it's about food. Most of my childhood memories are based around food. Fried frog legs at Aunt Caroline and Uncle Truman's house, church barbecues and potlucks, family get-togethers like Thanksgiving, Labour Day, Memorial Day, Mother's Day, Fourth of July, all based around the essential baked beans, devilled eggs and homemade ice cream. And if we were lucky, Mamaw's homemade sweet pickles would make an appearance. Oh how many times I remember begging my grandma for some sweet pickles at lunch. One of the articles mentioned over and over the rich and wonderful tradition of pickling and canning and how it is quickly being lost as the older generation dies. It's a great art that is not being carried on by us young folks. It got me thinking. My grandmother (on my dad's side) used to can. I remember once going into their storage room in the basement and seeing rows and rows and rows of canned vegetables. It was amazing. And my other grandmother (on my mom's side), as I've mentioned, made pickles. Delicious, wonderful sweet pickles. I've never been interested in canning (and I don't keep a garden so what really would be the point? ), but I have always been interested in pickling. I even bought a few jars when I moved to Scotland so I could make some bread and butter pickles. But I never did it, mainly because it takes a bit of work and Scott tells me people around here don't really do the pickle thing. 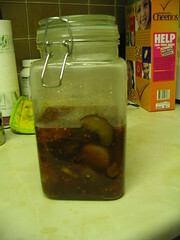 But after reading this article, I decided I am going to carry on the art of pickling. I'm going to get my mamaw's recipe for sweet pickles and carry it on as a family tradition. I'm a bit nervous about the whole actual pickling process - the boiling water in hot jars and the sealing process, but it's my first shot. We'll see how it goes. The internet is a great resource for finding out how to make jars hot and sterile and how to process the filled jars to make the seal, um, seal. I just hope I don't get to the end of the whole thing and then burst a jar because it wasn't hot enough or whatever. Anyway, I'll let you know how it goes. And if they taste righ, then Scotsfolk, you might want to give them a shot. Because homemade pickles are one of the greatest pleasures on earth. Well, these are certainly the most half-hearted pickles ever; the ice never fully froze so they were half-iced, I never found celery seed or pickling salt, so they were salted with coarse sea salt, and I discovered my jars weren't proper heatable jars so I could only heat them to about 60C, which is nothing close to 100C (boiling), which meant I had to let the boiled mixture cool a bit before ladling into the jar, but anyway, we'll see in about a month (or a week, since I couldn't boil the jars properly to seal them properly) how they turn out. 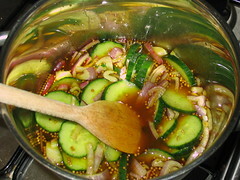 Boiling white vinegar, sugar, ground clove, tumeric and mustard seed mixture with cucumber and onion mixture. 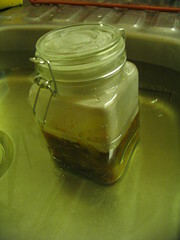 Heating the jars as well as I could with as hot but not going above 60C water. 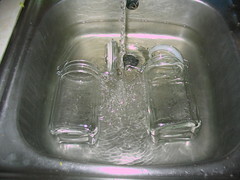 Processing the jars in not-hot-enough water to hopefully sort of seal them. Ready to store in cool, dark place for a while before eating.